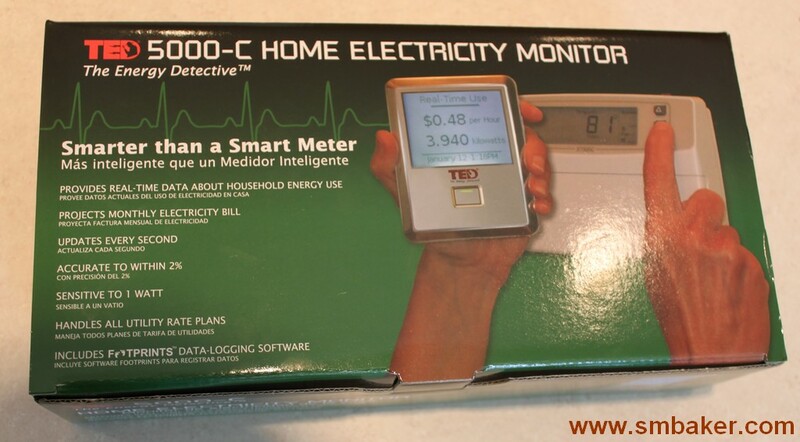 This is a review of the the TED-5000 from TheEnergyDetective.com. This is kind of a unique contraption, so lets start by saying what it is and why you might want it. There’s some psychological evidence that merely being aware of your energy usage will cause the average person to become more conservative. Take for example the Toyota Prius. It has a nice big fancy display right in the center of the dash showing your fuel economy. Ever drive behind a Prius? You’ll the the driver, either consciously or subconsciously often tends to accelerate more gradually, tends to coast more, and tends to use terrain more to their economical advantage. The reason is simple, they’re watching that damn display trying to maximize their fuel efficiency, and they’ve learned that certain techniques will improve this efficiency. They may be a pain in the @#$ to drive behind, but they’re minimizing the cost of their trip. Imagine if the same could be done for your house… What if you have a display that instantly showed you your energy consumption, both in kilowatt-hours and in actual dollars and sense. That’s exactly what the TED-5000 attempts to do. It’s composed of a series of components that starts with a device attached to your electric panel that measures raw energy consumption and ends with a little handheld display. It also offers PC software and integration with google power meter. Usually I don’t talk about the ordering process in a review because it’s not relevant and most companies get you the product in a timely manner. Well, things didn’t go all that smoothly with my interaction with theenergydetective.com. It started with the order itself, which had a notice to “expect delivery within 2 weeks”. Well, two weeks went by without any notification. I sent off an email to the company, and it was not responded to. Waited a few days and sent another email. No response. Left a voicemail. No response. Emailed the press department (I am writing a review, aren’t I?). No response. Eventually I gave up and assumed the item was vaporware. Notice came about three weeks after ordering that it had shipped, and on the fourth week I received via the local FedEx guy. Only problem was, the handheld display did not function. It received no updates from the gateway despite several hours of fiddling with it and double-checking the setup. So I used the technical support resources at hand, the support forums at TheEnergyDetective.com. I outlined the problem in detail with serial numbers and all information that was suggested on the tech support page. Gave it a couple days. No reply. Got frustrated and tried to call tech support. After hours (they’re on the east coast, I’m on the west), nobody there. Researched tech support forums in more detail and found lots and lots of reports of bad displays. Called tech support again, early this time, and got right through to someone. His response was “You’re not gonna like this, but I can’t tell if the problem is in the gateway or display so you need to send both back.” Seemed like an odd thing for a tech support guy to say, like he was expecting to catch hell for the faulty unit. I conceded and agreed to send back both components. Talked to the RMA department, relayed my previous experiences with the excruciatingly slow shipping and was told that the RMA would be handled in 24 hours. Back the items goes via FedEx to the east coast. 7 days there, 24 hours turnaround, 7 days back. That’s 15 days. No item. No notification from company as to reason for delay. No word whatsoever. So once again I get on the phone to to try to figure out what has gone awry with the RMA process. Turns out it took a week for them to process the RMA instead of the promised 24 hours. The ultimate time from order to receipt of a function product was nearly two months. This is rather inexcusable. I can get product samples all the way from Hong Kong in a week, and pay less for shipping. The moral of this story is don’t trust the automated shopping cart system on their website. Call instead and figure out what the “real” shipping time of the item will be. If you have an RMA, watch the tracking and call when they receive it. Call every day until it’s shipped if you need to. There’s something wrong with the shipping department at this outfit, so you’ll need to babysit them. Finally, don’t use the tech support forum if you have a technical support problem (it’s been a month and my issue never was answered). Call the tech support department. Ok, now that we’ve got that mess all straightened out, let’s get down to the actual device. 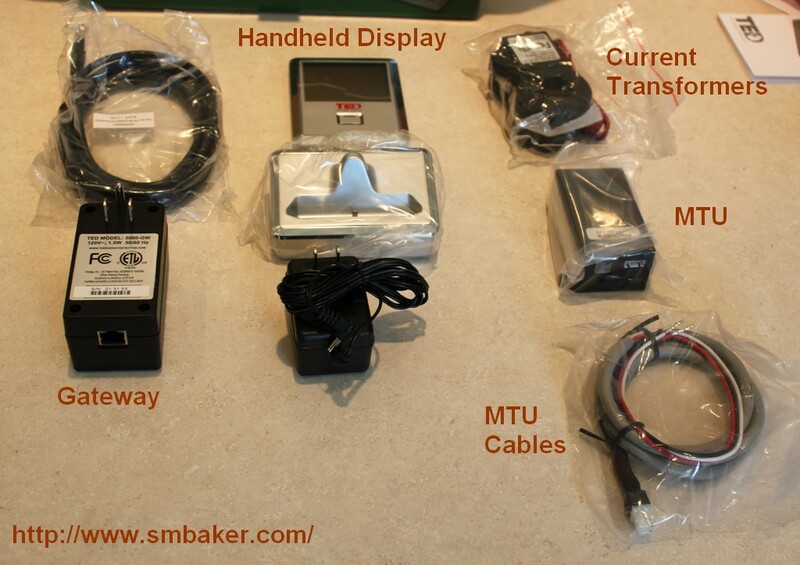 There are three components: the MTU, Gateway, and Display. The display is optional, and in retrospect I’d suggest skipping it and saving the money (more on that later). The MTU goes in your electric panel. You’re going to need some know-how to install it as you’re dealing with AC line current. Although the installation is relatively simple, you are working in the vicinity of live circuits, so if you don’t know what you’re doing them please stay out of the electric panel. The MTU includes a pair of current transformers that clamp around the outside of the two AC lines that feed the panel. The good news is that you don’t need cut into these heavy wires; the current transformers simply clamp around the outside. It measures current flow by means of electric induction, similar to clamp-on AC meters that electricians may use. While the current transformers measure the current flow, the MTU also needs to be connected via a circuit breaker to the AC circuits so it can measure voltage. You have a couple of options here, you can add a new double-pole breaker, or you can connect the wires to an existing double-pole breaker. 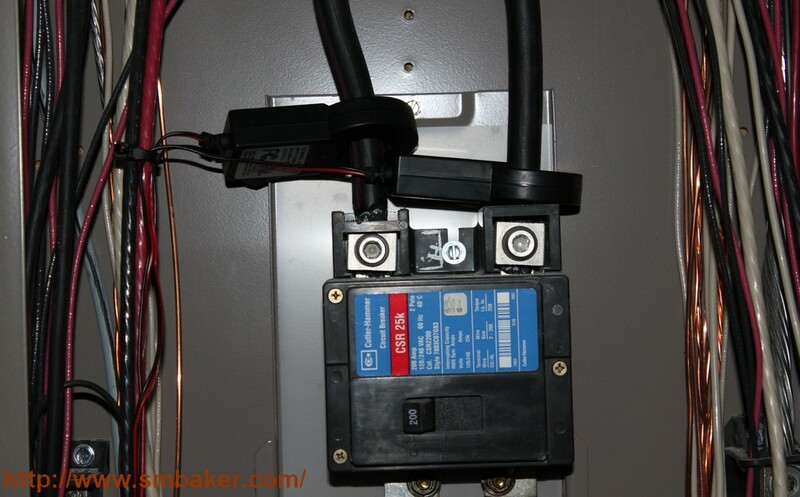 Fortunately, since you’re connecting through a breaker, you can shut off power to that breaker (or via the panel’s main breaker for that matter) so you don’t have to work on a live circuit. Our final piece of equipment is the handheld display. 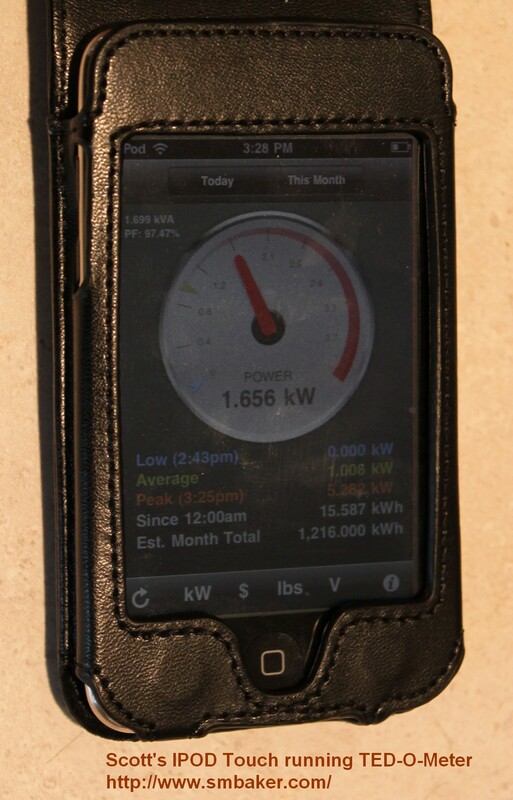 It’s a little portable monitor that shows your current energy usage. It has a built-in battery and includes a charging cradle. The size and shape reminds me a bit of one of the original ipods. Powerline communication – between MTU and Gateway. Similar technology to X10 home automation devices. 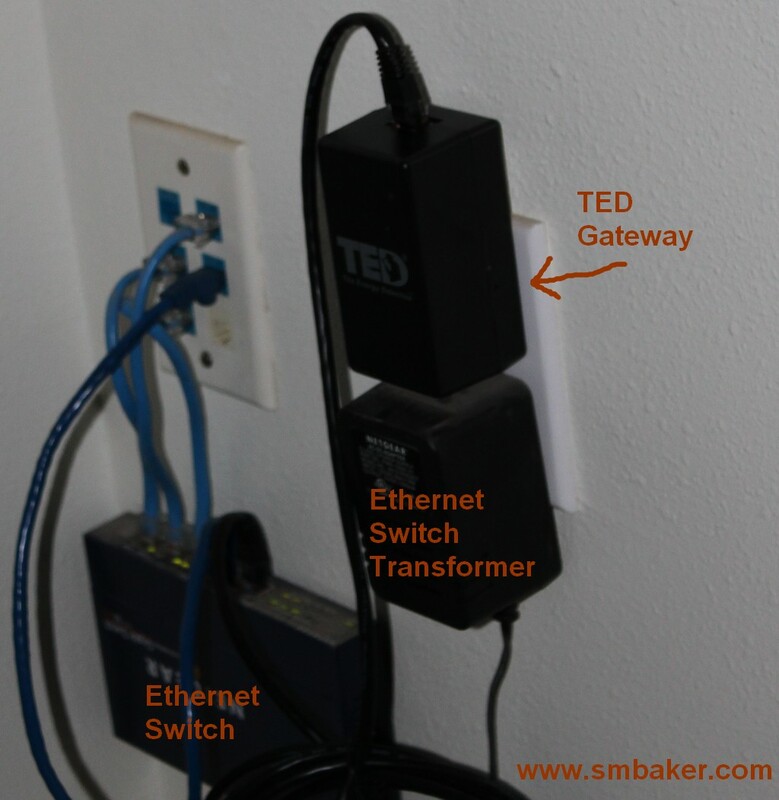 Ethernet – between Gateway and PC, or Gateway and Internet. Zigbee wireless – between Gateway and handheld display. Now let’s have a look at how information is presented. The most obvious thing is probably the handheld display. It’s default page shows “Real-time use” and includes dollars/cents per hour and kilowatts per hour. These are the two mose useful pieces of information. You can also tab through pages with the single button on the handheld display to view daily and monthy totals, cost projection, and voltage. The handheld display is adequate, but its monochrome display already looks somewhat outdated considering newer technology like the fancy iphones and ipods. Your other human interaction is going to be with software, either google powermeter or the supplied TED Footprints software. The Footprints software is very good offering an intuitive interface and is also the place where you configure settings for the device (such as entering your electric company’s rate information so the gateway can compute cost per hour). It displays information on a large round gauge and a series of bar graphs. It also includes some charts that can be used, but I really didn’t like them very well. It seemed like the charts would only as long as the browser was open viewing the TED page. For charts and history, google powermeter seems to be the way to go. It’s a free service provided by google that stores data for your energy usage and allows you to view history. It puts a convenient google gadget right on your google homepage (or search page). 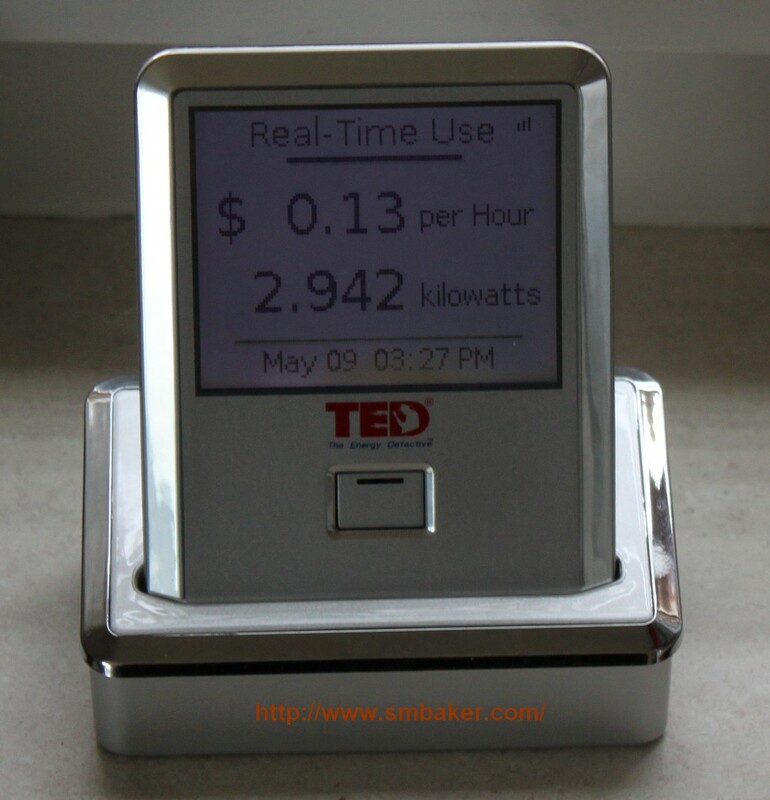 The TED-5000 gateway can be setup to automatically upload its data to google powermeter. In conclusion, ignoring the difficulty in ordering and the defect in the handheld display, I really like the device. It does exactly what I expected it to, allowing me to view the whole energy consumption for the house. I’ve already saved some money with it by noting abnormal energy usage and realizing that certain devices were left on. The one thing that would make it much more useful would be if more MTUs could be added for individual devices (an MTU to measure the air conditioner/heat pump for example would be handy). The TED can be configured with multiple MTUs for alternative energy sources (solar, etc) but I don’t think it can use more MTUs for specific device measurement. They really ought to add that. The handheld display is something that I’ve griped about a couple of times (primarily because I’m still irritated over having to RMA it, along with the gateway). If I had it to do over again, I’d certainly have saved my money and not purchased the handheld display. My ipod touch can do everything the handheld display does and a whole lot more.